The day of lovers is approaching: have you decided yet how you will celebrate Valentine's Day in 2019? It's the perfect moment to enjoy quality time as a couple, for a romantic walk in a new place to discover, for a candle-lit dinner in your favourite restaurant. Let's not forget, however, the tradition of exchanging gifts with your partner: have you already made up your mind how to surprise your girlfriend or wife with a thoughtful gesture? Flowers, chocolates and cards are always nice, but this year you really want to take her breath away and express your gratitude for all the ways she brightens your life every day. We have created a collection of romantic jewellery to bestow upon your better half this Valentine's Day: rings, earrings, bracelets and necklaces, distinguished by a sophisticated design and high quality materials, always guaranteed by the Made in Italy mark of quality. Discover the perfect piece for your sweetheart! A piece of jewellery is always the perfect gift for a special lady. Whether the style is casual or more classic, the perfect accessory always enhances any outfit: that's why a woman keeps on wearing an accessory that personalizes her outfit every day. Give the love you share the starring role by choosing a piece of jewellery that will celebrate it throughout the day. Among our accessories to dedicate to your beloved for this Valentine's Day you will find romantic necklaces with heart-shaped pendants, exclusive rings adorned with white pearls, bracelets in steel, silver, yellow and rose gold, for a glamorous accessory to keep always. Discover our selection of women's jewellery to give for a truly special Valentine's Day 2019! In 2019, will you and your darling be spending your first Valentine's Day together? Does the choice of gift for your girlfriend seem to be the most complicated business there is? Don’t worry: we have come up with a selection of stunning jewellery for you that will give every girl a smile! Among our precious suggestions you will find rings, bracelets, necklaces and earrings perfect even for young women and girls. We have jewellery and romantic accessories starting from very affordable prices. And if you really want to amaze your better half, you can create for her a unique bracelet that tells your love story. 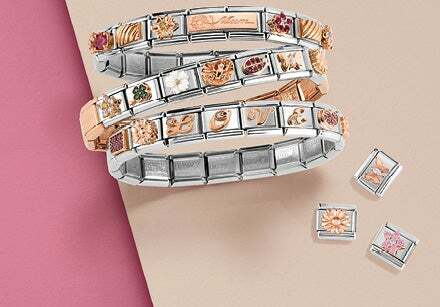 Choose Composable, the bracelet that is customizable with precious linking tiles that represent you both: you will find links and charms decorated with the most tender symbols of love, gold letters, and romantic engravings. All you have to do is choose the right ones for your sweetheart! Do you think that the right jewellery for your girlfriend or wife is a precious necklace? In this case, also, we have selected the most romantic jewellery to bestow upon your partner for a very special Valentine's Day! Hearts, dazzling stones, stars and romantic engravings decorate the pendants of the most beautiful necklaces ever: you simply have to choose the necklace that best represents your better half and your love story. Discover all the Nomination necklaces and choose a special gift for this Valentine's Day 2019: all Nomination jewellery is guaranteed by the Made in Italy mark of quality.